Even though geography and medicine were well known concepts taught in numerous books, geography was the primary topic in books used to educate anyone interested in politics and law throughout much of the 17th and 18th centuries. The study of geography was essentially a study of the world and its major continents, cultures, landforms, regions, and the relationship each of these had to each other. 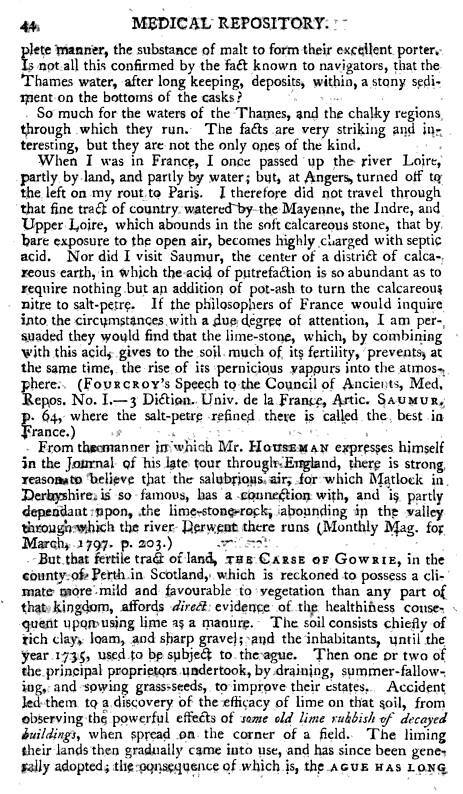 Medicine was its own unique field of study, rarely integrated with geography except when geographical features appeared to have a relationship to the healthiness of particular regions. 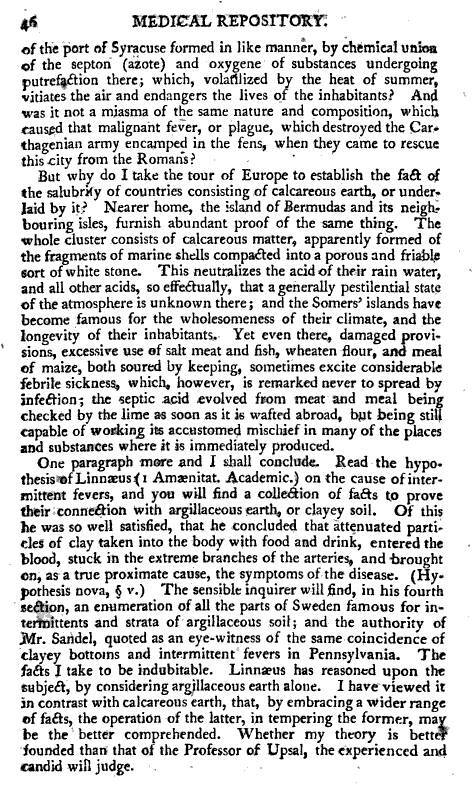 Samuel Mitchell changed all of this by linking paleontology and geological evidence to disease patterns, by doing like many physicians by linking weather and climate to disease, but then taking the sciences one step further by trying to relate such previously unrelated topics as hail to influenza, fossil beds to pathogenic effluvium and the need for better wool, mineral springs and crisp, clear mountain waters and the healthiness of woodland setting free from the putrfactions of decaying animal carcasses from a local butcher, or smelly tanned and curried hides used to produce saddles, coats and shoe leather. 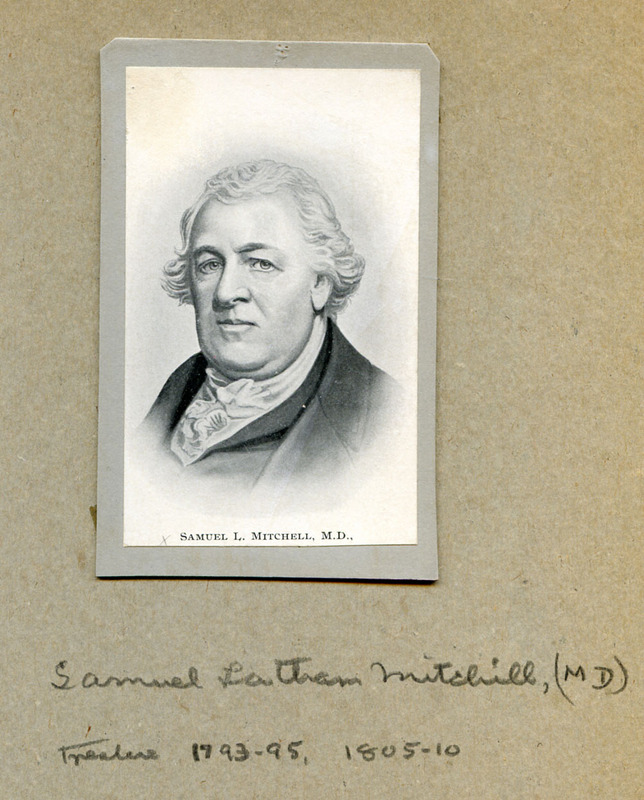 Mitchell’s view of medicine was that it is a study of natural history, and that disease was one of those basic components of nature that people had to adapt to or risk extinction, according to some very popular Lamarckian and Erasmus Darwin teachings. Many of the concepts underlying the development of a field known as medical geography were already present in the medical writings, some concepts existing since Aristotle, Plato, Pliny and Hippocrates first wrote down their observations about geography and human or animal medical problems. It wasn’t until all of the topics came together to define a natural history feature of disease and medicine that anyone made the efforts to pull each of these teachings together into a single medical philosophy and belief system. 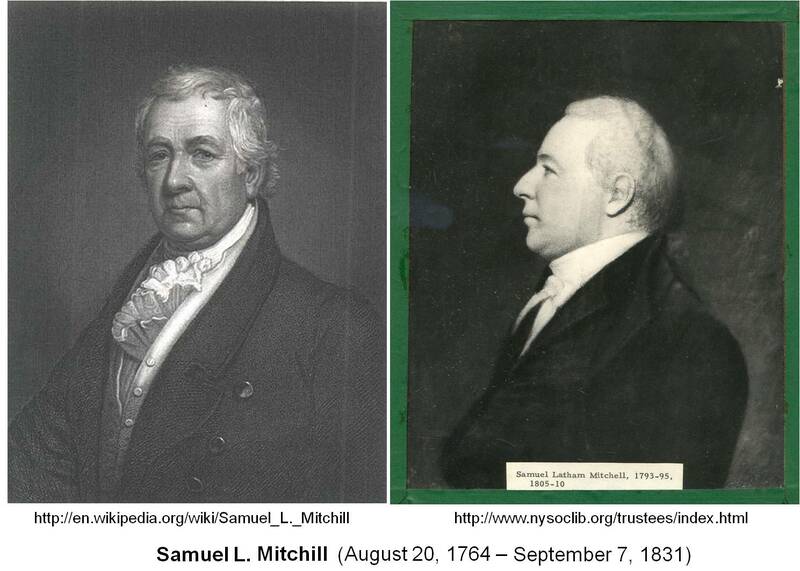 Samuel Mitchell was an MD and professed writer and university teacher in the natural sciences, trained in Edinburgh he returned to the United States and became affiliated with New York City well after the post-Revolutionary War years. 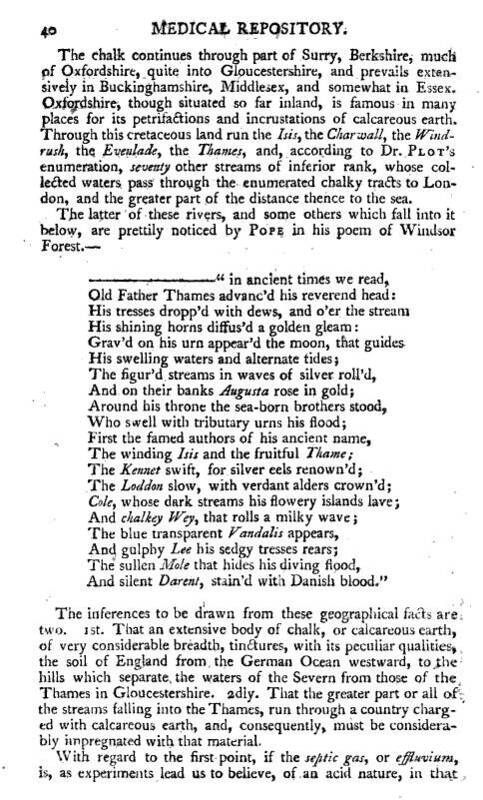 Immediately preceding his rise to fame for his eclectic as well as eccentric were several other works on medical geography that helped him development his first writings on this topic. There were at least two German writings on the earth’s surface and diseases. The first covered the health of mostly the inhabited parts of the northern hemisphere of earth at the time, and included no real maps depicting the claims made in its text. The second came just a few years later, during his years of teaching at Columbia College. It was also written in German, but contained a lot more details about the association of diseases and regions of the earth. 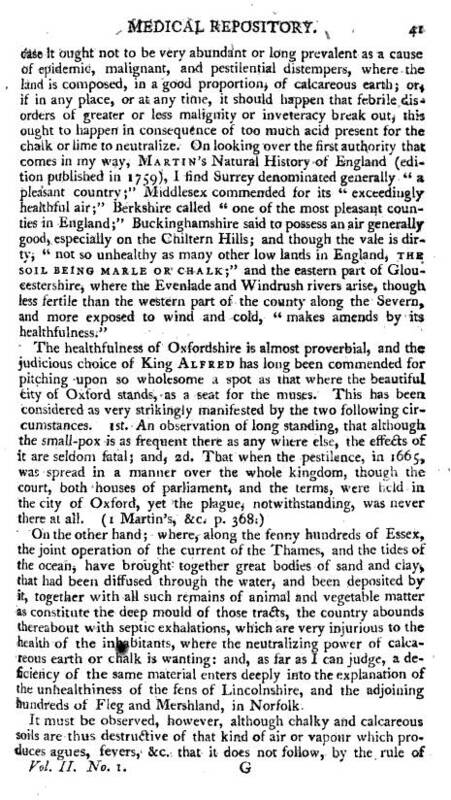 About this same time, theories were being proposed about the effects of geological forms on disease patterns. The calcareous rocks in certain parts of the world were found to prevent certain diseases from developing. These rocks became associated with whether or not miasma could be formed in some settings. It impacted the behaviors, temperature and potability of potential drinking waters. 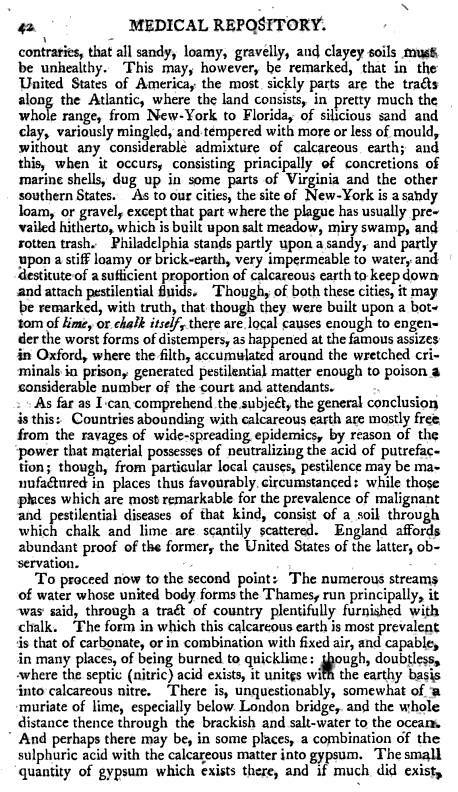 It was often found to be common to regions where fevers and certain forms of dysentery failed to emerge as endemic or epidemic diseases. It would later be discerned that geological strucutres acted this way due to their underlying alkalinity, but this underlying chemistry of the substratum and its effects upon disease would not be fully understood for another generation or two. Meanwhile, as this understanding of the impact of geology on diseases came to be, several studies performed over the next year in the new field of chemistry would beging to solidify its own concepts over the next 5 or 10 years. As the two German writings had their major impacts on medicine, these writings in combination with other natural history studies of miasma and contagion in relation to diseases behaviors helped establish medical geography as a topic of importance to medicine. During the first decades of the nineteenth century, the geography of health and disease was one of primary philosophies covered in any medical writings, training or apprenticeships. 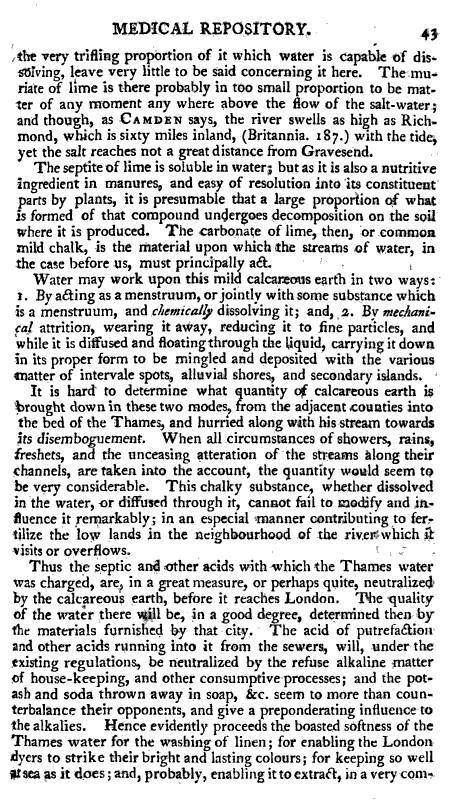 These theories for disease on weather, climate and topography as the most important features use to define the behavior of most important causes for disease, be they miasma, swamp gas, effluvium, air (gas) emitted by certain rocks, air released from loose soils, or the putrescence and smell of local garbage sites, bad food, drying salted meats, tanned hides, or decaying animal and plant detritus. The following article is one of the first articles on this topic published in the United States in which the term ‘medical geography’ defined. This article thus requires recognition for being one of the earliest such articles on this topic, in spite of the antiquated theories underlying any geographical links to disease that were proposed. 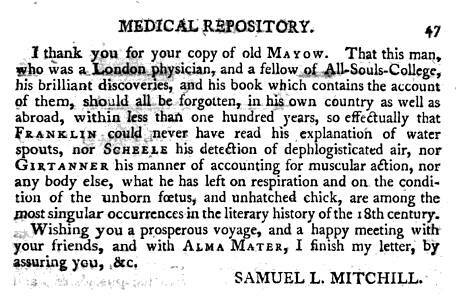 This work was penned by someone whom many doctors considered to be New York’s “walking encyclopedia” or “Renasissance Man” in medicine — Dr. Samuel Mitchell. 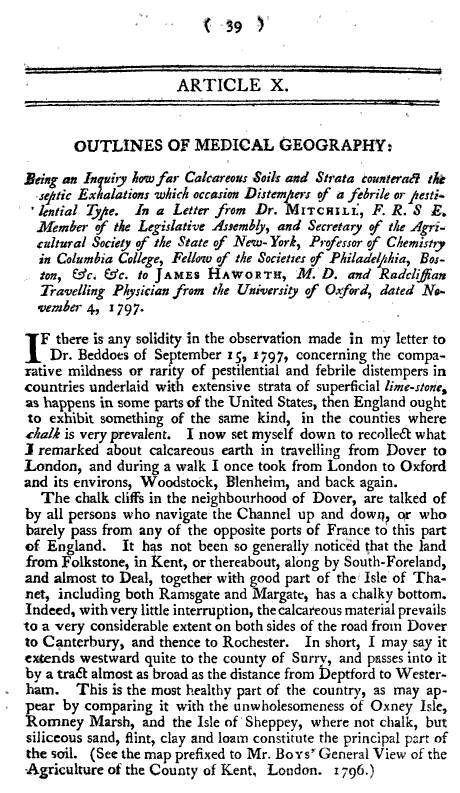 1792 -1801 – taught chemistry, botany, natural history at Columbia College; founding editor of The Medical Repository, the first medical journal in the United States. 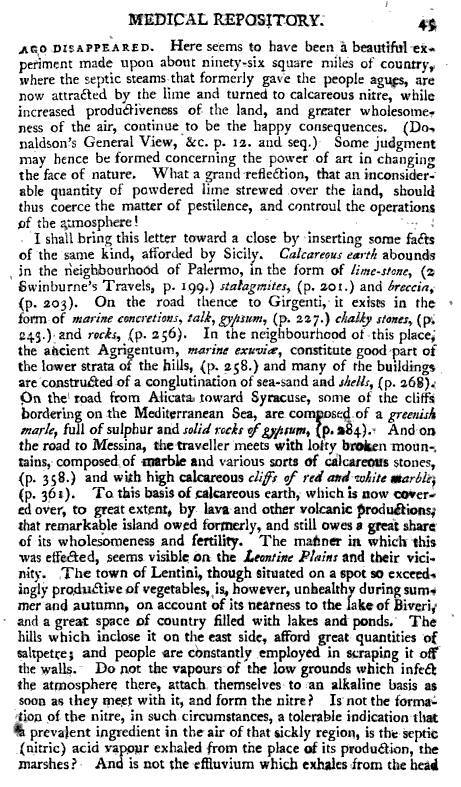 Lectured on botany, zoology, and mineralogy; collected, identified, and classified many plants and animals, particularly aquatic organisms. 1807 – 1826 – College of Physicians and Surgeons of New York professor who helped organize Rutgers Medical College of New Jersey, serving as vice president until 1830. His own version of the phlogiston and his septon theories for disease were chemical based, resulted in important personal hygiene recommendations and led to the establishment of new sanitation practices. November 23, 1804 – March 3, 1809 – elected and served as U.S. Senator from New York.